Ohh hey nice weather! I’m looking at YOU! The sun is here (hopefully to stay! 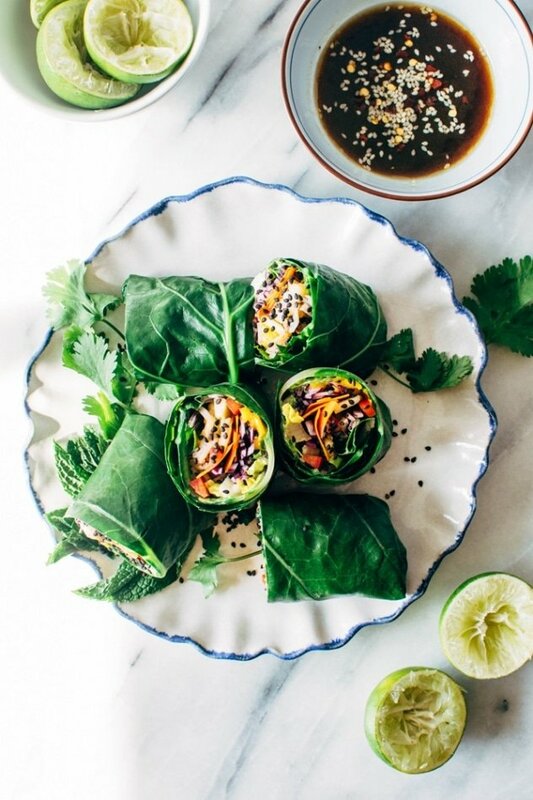 ), summer is just around the corner, and we’re eating alllll the crunchy, spicy, SUPER HEALTHY rainbow collard green spring rolls with shrimp. Tangled crunchy veggies. Perfectly pan seared shrimp. Spicy mayo, avocado, or both! A salty and slightly tangy dipping sauce to go with it. Yes yes and yes. 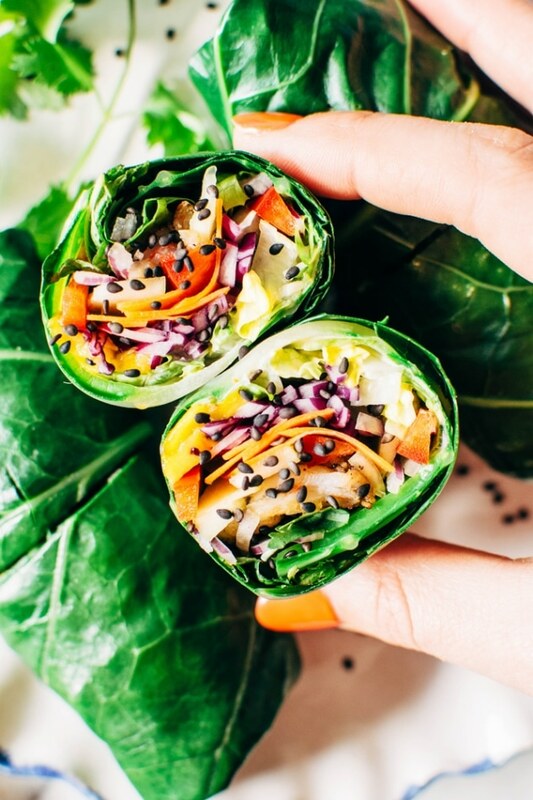 Every time I eat collard green wraps I always feel this major blast from the past – memories of collard wraps filled with greens and sliced fresh veggies, salads, cashew “cheese”, sprouted seed crackers and a dehydrator running 24/7 in our little apartment run through my head. You see, shortly after starting college I started eating a vegetarian diet, which quickly transitioned to eating vegan, which then led me down the exploratory path of eating a 100% raw vegan diet. It lasted just shy of a month, after which I realized it wasn’t exaaactly the right fit for me. I found my energy levels to be majorly lacking and after eating an enormous meal, I still didn’t feel satisfied or full. Not good things! But since every experience gives us the opportunity to learn something about ourselves or the world we live in, I did gain some really valuable skills in preparing and incorporating raw foods into my every day eating habits. And it also taught me the priceless lesson to listen to my body’s signals for what works for, and what works against my health. It was shortly after this little venture into raw foodism that I did a complete 180 and started consuming meat and animal products again, but this time with more intention. Choosing pastured and organic animal products, knowing where they came from, how they were processed and how MUCH of them I was eating. And of course my journey toward optimal health was not over at that point – and I don’t think it ever will be. Our bodies are constantly changing, requiring new types of attention and nourishment + we are always within that feedback loop of taking care of ourselves the best way we know how, reading the information our bodies send back to us and adjusting as we go. It’s kind of a really cool thing if you tune into it. And why I loooooove them. A collard green wrap is a single collard green leaf, stem and spine trimmed, blanched or lightly steamed, until bright green in color and cooked just enough to be pliable, but not so much that the fibrous part of the plant starts to break down and dissinegrate. That way they’re sturdy enough to hold up to being filled, wrapped, and tucked away in the fridge for weekday lunches or as an excellent healthy travelling meal. Which we all need more of sometimes. And man do I worship them. You can fill them with just about anything you can think of – everything from turkey, avocado and cream cheese to a more veg heavy recipe like this one we’re talking about today. 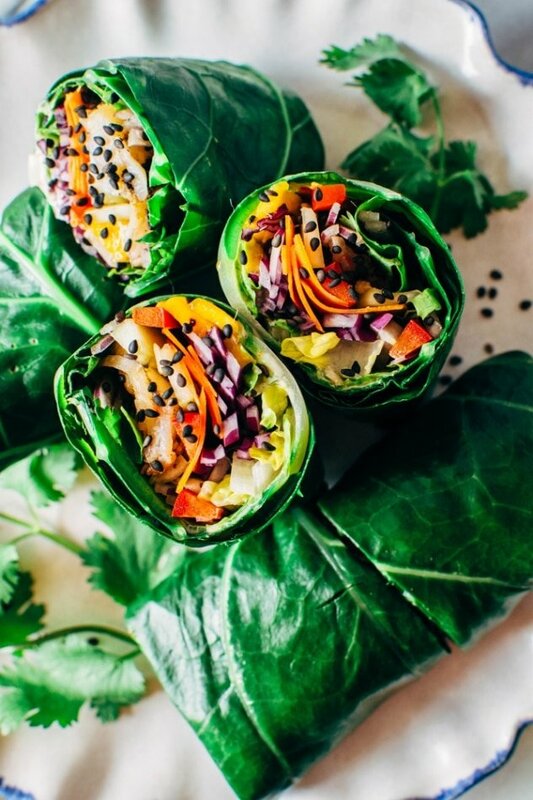 AND they’re a far more nutrient dense then just about any other vessel for wrapping and rolling – as an honored member of the cruciferous vegetable category, they boost a large variety of healthful benefits. In other words, kiiiind of a super food! Or at least one of those vegetables that you want to make sure you’re including in your meals. 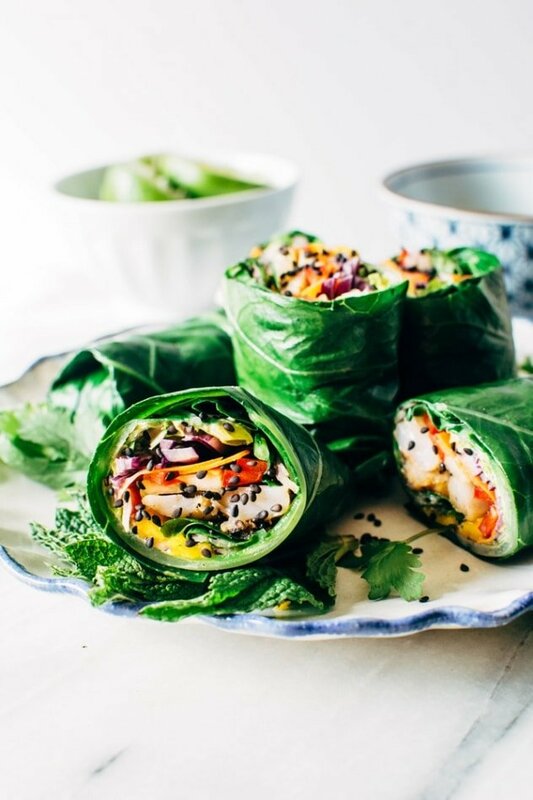 Sooo why not start with these rainbow collard green spring rolls with shrimp?! They’re the perfect hand-held lunch, dinner or snack that packs a serious flavor and nutritional punch. Keepin’ us healthy and satisfied on the go cuz life can be busy but the quality of food we eat doesn’t have to be sacrificed! so what’s inside and how do I assemble them? All these ingredients get layered onto your bright green, blanched collard green and rolled up like you would any other wrap or tortilla. 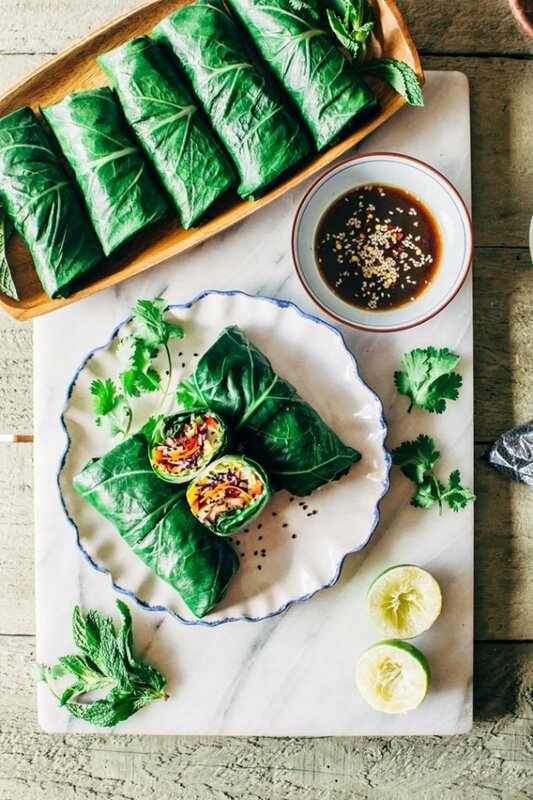 Tuck in those sides as you roll and you’ve totally reached collard green spring roll expert level STATUS! Want more nutrient dense recipes? Check out these favorites! 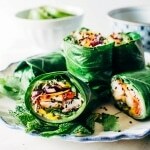 Rainbow collard green spring rolls with shrimp! Layers of tangled crunchy veggies, perfectly pan seared shrimp, spicy mayo, all tucked inside some SUPER HEALTHY collard green wraps! Prepare all the vegetables and herbs for the rolls and set aside. Wash and dry shrimp thoroughly. Place in a large bowl and toss to coat evenly with salt, pepper, coconut sugar and garlic powder. Heat a large saute pan to medium high with 1 tbsp avocado oil. When pan starts to smoke add shrimp and cook, allowing to brown before flipping, until cooked through and just starting to char. Set shrimp aside to cool on a plate. While shrimp are cooling, prepare the collard wraps. Cut away the stem, and trim the spine, without cutting through the leaf. Bring a large sauce pan of water to boil and prepare a bowl or a shallow dish with ice water next to the stove, and a plate with some kitchen towels. When water is boiling, reduce to a simmer, and submerge leaves, one at a time, for about 30-45 seconds (depending on how thick they are). Be careful not to overcook, as they will get too soft to work with. When each leaf is done, dip it into the ice water for at least 10 seconds to stop the cooking, move to the plate and pat dry with kitchen towels. After collard greens are ready and shrimp has cooled, cut the shrimp in half so they’re not so thick. In a small bowl whisk together the coconut aminos, coconut vinegar, lime juice, sesame oil, a few sesame seeds and a pinch of chili flakes. Set aside. In a seperate small bowl stir together mayonnaise with hot sauce, adjusting the amount of hot sauce to fit your taste! 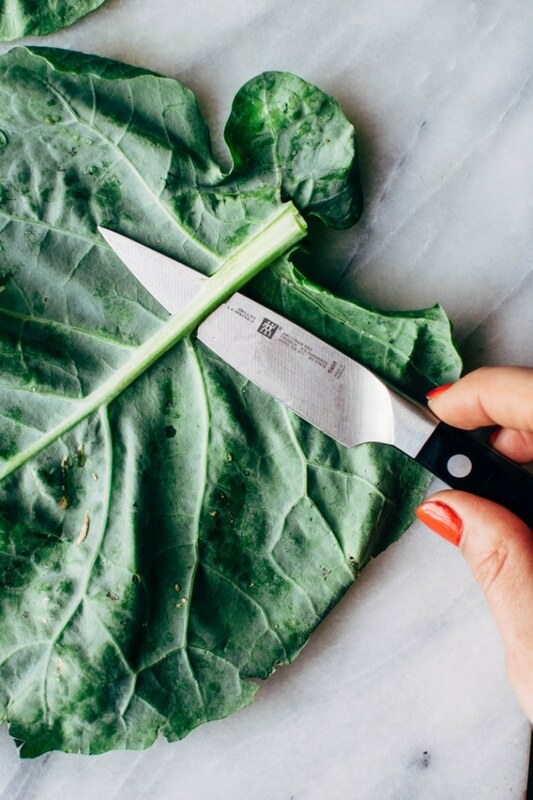 Lay a collard green out on a flat surface. Spread a bit of spicy mayo (or avocado) just a little ways back from the center (toward you) of the leaf. Place a little bit of each filling ingredient on top of the mayo – lettuce, purple cabbage, carrots, cucumber, peppers, shrimp, red onion, fresh herbs and a sprinkle of sesame seeds. If one leaf seems like it will be too small, you can layer two for more surface area. Fold the sides of the leaf over your filling ingredients, and then the back piece (closest to you), over the top of that. Roll the collard green around the filling using your fingers to keep the sides tucked in just like you would roll a burrito. Done! Set aside and repeat with remaining leaves and filling. When ready to serve, cut in half and serve with dipping sauce. This entry was posted in dinner, lunch, snacks and tagged collard greens, collard wraps, dairy free, easy, fresh, gluten free, grain free, healthy, nyssa, nyssa's kitchen, paleo, quick, recipe, shrimp, snack, spicy, vegetables on June 2, 2017 by Nyssa Tanner. Aww thanks love!! Colorful food = my absolute faaavvve!! !